Australian paramedics have been thanked for fulfilling a terminally ill man's desire for an ice cream sundae on his final trip to hospital. The gesture happened last week but has been shared publicly in a Queensland Ambulance Service (QAS) Facebook post. 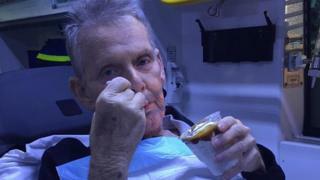 They said paramedics had acted after learning their patient, Ron McCartney, 72, had eaten little in previous days. "The officers asked Ron, if you could eat anything... what would it be?" the post by QAS said. "To which Ron replied, a caramel sundae." The ambulance service said it had been left "humbled and tinged with sadness" after receiving a message of gratitude from Mr McCartney's wife, Sharon. His daughter, Danielle Smith, said that her father had died on Saturday in palliative care, following a 17-year fight with pancreatic cancer. Ms Smith told the BBC that her family was grateful for the kindness and quality of care given to her father. Earlier, she wrote on Facebook: "Dad enjoyed this so much and [it] was the last thing he was able to eat by himself. "Mum and I cannot thank QAS enough for all the help and compassion you have all given towards us." The state ambulance service received similar praise last year after it fulfilled a dying woman's request to visit the beach for the last time. In its post about Mr McCartney on Tuesday, the ambulance service said its gesture underlined "an often-unseen aspect of patient care; the caring". The post has drawn hundreds of supportive messages from the public. "Something so simple can have a huge impact on people who need it the most," one commenter said. A woman who identified herself as an emergency worker wrote: "It's too easy to focus on the lights [and] sirens aspect of the job, but this is what the real meaning of the job is."